This article describes the methods of septic tank baffle repair by the installation of replacement septic tank inlet and outlet tees. A septic tank replacement "Tee" is simply a standard plastic pipe in the shape of a "Tee", typically 4" or 6" in diameter, that is inserted at the septic tank inlet or outlet to serve the function of the original septic tank baffle that may have been damaged or lost. 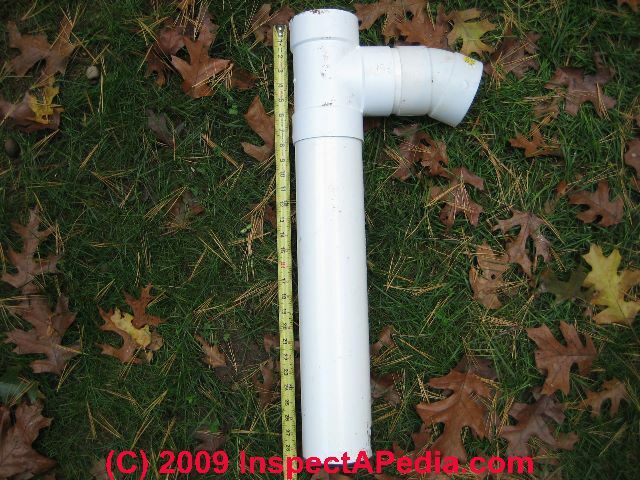 This article explains the requirements for septic tank inlet tees and septic tank outlet tees and explains why the length of the tee extensions is important to prevent septic tank or septic piping clogging and to protect the life of a drainfield. Links to related septic system testing and design information are given. We address septic waste line tee sizing and we include tank tee installation suggestions. Discussed: What Are Septic Tank Baffles or Tees? 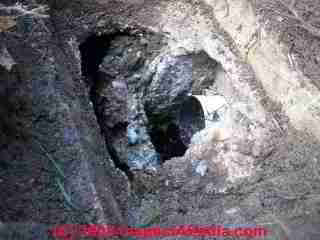 Inlet Baffle Inspection & Outlet Baffle Inspection - Effects of septic tank tee loss or septic tank baffle damage on the septic drainfield life. Signs of Septic Tank Baffle/Tee Trouble. Septic Tank Outlet Filter Add-on. 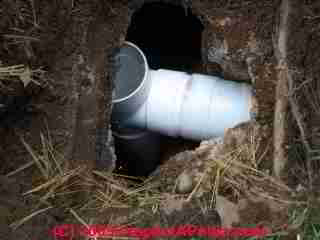 Septic tank outlet baffle or tee is installed deeper into the septic tank than the inlet tee. Septic tanks installed backwards - with outlet opening higher than inlet opening cause sewage clogs and trouble. WHAT ARE SEPTIC TANK BAFFLES OR TEES? What is a Septic Tank Tee or Baffle or Gas Baffle? Septic tanks may come with a baffle to prevent scum from clogging the inlet or outlet piping and septic fields. Often the baffle is insufficient in design, and on steel septic tanks the baffle may rust off, leading to blocked septic systems and septic field failure. A common repair or improvement is to install plastic pipe septic tees in the septic tank to perform the function of these baffles. In the septic tank photo at left you can see the green PVC sewer line entering the tank at left, and at right you can see black sewage debris atop the concrete septic tank baffle. The septic tank baffle or tee is a device on the inlet or outlet of a septic tank which prevents sewage back-flow into the inlet or outlet pipe. The device may be made of concrete, steel, plastic, or other materials, but in all cases the septic tank tee or baffle forms a barrier between the septic tank and the inlet or outlet pipes to or from the septic tank. Level the septic tank: The septic tank inlet tee is designed to be higher than the septic tank outlet tee. This helps assure that incoming sewage clears the baffle and enters the tank correctly, while outgoing effluent does not carry along floating solids, scum, or grease (which would clog the drainfield). For this reason the when the septic tank itself is placed into the ground, the septic tank should be installed level. If the septic tank has settled and is no longer level it would be very difficult to re-position the tank, but it may be possible to make corrections at the tank inlet tee and outlet tee to cope with this change. Where a replacement PVC plastic septic tank tee is installed into a steel or concrete septic tank, the outlet or inlet tee is a standard pipe tee, typically of the same diameter as the incoming sewer line, placed at the inlet of a septic tank to prevent the inlet sewer line from being clogged by floating scum and waste in the tank (resulting in a blocked septic system). On the inlet side the septic tank baffle is intended to permit waste to enter the tank, but to avoid clogging of the tank inlet. The septic tank inlet baffle accomplishes this job by blocking the floating scum layer, a thick layer of debris that forms naturally at the top of a working septic tank, from blocking the tank inlet pipe. At SEPTIC TANK BAFFLES we describe inspecting the condition of the septic tank baffles when the tank access ports have been opened, for example when the septic tank is about to be pumped. The septic tank inlet baffle also reduces the movement of gases from the septic tank backwards into the building that it serves. Any gases that do escape the tank in this direction should be venting above the building's roof through its plumbing vent system, provided that system is itself correctly installed. The septic tank outlet tee blocks floating scum and sewage from flowing out of the tank where it would rapidly clog the drain field and effluent piping. Located on the septic tank's outlet end where the tank is connected to piping intended to conduct clarified septic effluent to the absorption system (drainfield), the septic tank baffle or tee, also called a Gas Baffle in some literature or regulations, keeps solid waste and gas bubbles away from the septic tank outlet, thereby reducing the carry over of solid particles from the septic tank. Odors around the drainfield might be due to loss of the gas-baffle in the septic tank. Of course such odors may also be due to a failing drainfield, so further diagnosis is in order. Checking the presence and condition of the septic tank outlet baffle (gas baffle) is done at the septic tank and should be quick and easy. If the outlet baffle is lost it should be replaced, but you should also assume that the drainfield has a somewhat reduced future life. Backups at the waste line leaving the building, or apparent clogs in the pipe between the building and the septic tank could be caused by a lost septic tank inlet baffle which has led to clogging of the tank in that area, resulting in a slowed or even totally blocked flow into the tank. If the plumber simply clears the line between house and tank, without repairing or replacing a lost septic tank inlet baffle, the repair will not be long-lasting. See SEPTIC TANK BAFFLES for an explanation of how to observe clues at the septic tank baffles or tees to look for signs of tank flooding when opening the septic tank for cleaning, pumping, or inspection. See SEPTIC TANK LEAKS for an explanation of how and why septic tank leaks cause septic system failures. If the SEPTIC TANK BAFFLES have been damaged, lost, or are inadequate, a septic tee should be installed at both the tank inlet [photo] and outlet [photo] . 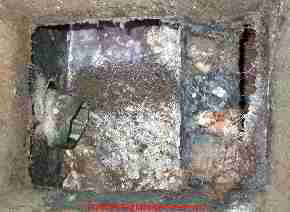 Our photo at left, compliments of architect Jerry Waters, [reference] shows a badly deteriorated concrete septic tank baffle. A damaged baffle such as this one will permit floating scum and solids in the septic tank to block the septic tank inlet, leading to a sewer backup in the building. Damaged tees may also increase the movement of sewer gases back up the sewer line into the building. While a septic tank designer could specify the exact numbers that s/he would want us to use for installing the inlet and outlet tees for a septic tank, we have not yet found such a specification. Most installers use local "rules of thumb" for septic tank baffle design. Perhaps this is because the inlet and outlet tee dimensions for a septic tank depend on the size and depth of the tank as well as the anticipated thickness of the floating scum layer in the septic tank. To install a pipe tee at a septic tank inlet or outlet pipe where the original baffle has been lost, it is necessary to excavate the septic tank, remove the cover, and gain access to the inlet and outlet pipes just inside the tank near the top. The cost of the 4" to 6" diameter plastic pipe tee will be trivial, just a few dollars each, for a total of usually less than $20.00. The cost of excavating and opening the septic tank so that the tee can be installed depends on your particular septic tank installation, the depth of the tank, and its condition. As you can see in this photo of standard 4" PVC pipe fittings assembled to form a replacement septic tank tee to repair the tank with the damaged concrete septic tank baffle shown above, the parts are assembled into a tee with the longer extension to be inserted downwards into the septic tank. In architect Waters' photograph of these septic tank baffle repair parts (above left), he has used a 22 degree elbow to connect the tee to the sewer line entering the septic tank. Mr. Waters used the angled elbow rather than a straight connection on the tee to avoid bringing the top of the "tee" fitting too high in the septic tank. You don't want the replacement tee to slope upwards nor do you want any obstruction in these fittings that could cause a blockage of sewage entering the septic tank. The center of the plastic tee is inserted into the septic tank inlet opening just inside the tank, and the tee is installed vertically as you can see in our sketch above. If the center of your plastic tee is female rather than male, the larger hub may not fit into the septic tank inlet or outlet opening. In that case your installer may need to glue a short length of plastic pipe into the female tee hub so that you can install this fitting. Keep the new inlet or outlet septic tank tee close to the tank wall as shown in our sketch. Mr. Waters' photograph (left) shows the new PVC septic tank tee parts in position in the septic tank. You'll notice that he had to chip away the remains of the concrete septic tank baffle to get the new plastic parts in place. On steel septic tanks removing the remains of the steel baffle will also be necessary - don't get cut or you risk a serious infection. What you'd want to see at the inlet is that the top of the tee clears the tank cover when it's put on and that it's clear of the top of the floating scum layer - otherwise it'll get blocked. The bottom of the tee should be BELOW the BOTTOM of the floating scum layer when the tank is filled to its normal level. Otherwise your incoming line is going to be blocked by the scum layer. The inlet tee also slows the water as it flows into the tank so that you don't stir things up inappropriately. In the informal drawings we have at hand the bottom of the inlet extends to just above the middle of the tank depth - we guess the presumption is that this clears the bottom sludge layer and the top scum layer. Just as the inlet tee needs to extend below the floating scum so as not to become blocked by it, the outlet tee needs to extend 2 or 3 inches DEEPER than the bottom of the inlet tee. This keeps sewage and floating scum from running out the tank outlet where it would quickly clog the absorption system or drainfield. So, and let's take a typical septic tank that is maybe 5 feet of internal depth. The inlet pipe enters the tank perhaps 6 inches below the very top edge of the tank (top edge of the tank to top edge of the inlet hole) and is about 4 inches in diameter. So the bottom of the septic tank inlet opening (and outlet opening) in our theoretical example is about 10 inches from the top of the tank. This will define, roughly, the height top of the floating scum layer. (Even though the scum layer is blocked from flowing out of the tank by the outlet tee, it will rise up to about the same level as the bottom of the outlet tee, or slightly above it. That means the bottom of the 8 inch thick floating scum layer would extend down in the tank to about 8 inches below the bottom of the tank inlet opening. Your inlet tee had better be at least a couple of inches deeper than that or your scum layer, else the floating scum will clog and back up the septic system. So for these example dimensions I'd make my inlet tee extend down into the tank at least 12 inches below the bottom of the tank inlet at a minimum. In the septic tee replacement parts photos shown above, Mr. Waters assembly was just under 30" in total length, including the vertical dimension of the PVC pipe tee itself. Should we make the inlet tee bottom extension longer? I'd bring it to perhaps a little above the mid-depth of the waste that's going to be in the tank - putting it between the bottom of the floating scum layer and the top of any sludge on the tank bottom. A bit longer means the tee does a bit better job of slowing the incoming wastewater down. So I might make my inlet tee extend down 14 inches to 16 inches into the tank. Are Septic Tank Tees Open or Shut at their Top End? What is to be done at the top of the new septic tank tee after it's inserted into the tank inlet (or outlet) pipe? We leave the tee top open, yielding a septic tank function and design similar to that found on concrete septic tanks. Jerry Waters' photograph of the finished septic tank replacement tee (left) shows that he installed a grate on top of the septic tank tee top opening. The grate body needed to be trimmed down to minimize its height as the top of the tee in this installation was very close to the under-side of the septic tank cover. Waters wanted to reduce the chances of solids flowing over the top of and clogging the septic tank inlet tee should there be a tank outlet blockage. DO NOT install any grate or blocking device on the bottom of the septic tee extension of the system will clog very quickly. If the septic tank tee outlet bottom end becomes clogged with debris, the open tee top provides an emergency "overflow" outlet that may keep the system working without backup until it's discovered at the next septic tank pumpout. In fact, when cleaning the septic tank we like to inspect the tank inlet and outlet baffles or tees specifically to look for evidence of sewage flowing over the top of the tee or baffle - a condition that would indicate a problem, perhaps a blockage at the tank outlet tee or baffle, a blockage in the tank outlet effluent line en route to the drainfield or distribution box, or a problem with the drainfield itself. To complete the septic tank tee insertion project that replaced the damaged original concrete (or steel) septic tank baffles, make sure that all of the septic tank covers and access port covers are sound, safe, and child proof. Falling into a septic tank is likely to be fatal. Also check that ground water or surface runoff are not entering the septic tank at the sewer pipe inlet or outlet ends of the tank and similarly that runoff is not entering the septic tank at its covers. Flooding the septic tank speeds the demise of the drainfield. See details at SEPTIC TANK LEAK. Finally, to maximize the septic system drainfield life, make sure the septic tank is cleaned (pumped out) on a regular schedule. See SEPTIC TANK PUMPING SCHEDULE. Thanks to architect Jerry Waters for contributing these septic tank tee replacement photos and for suggesting clarification on the requirement to leave the top of the septic tank tee open. The septic tank outlet tee is slightly different from that found on the inlet side of the septic tank. As you see in the sketch and in the sketch of both inlet and outlet tees in the septic tank at the top of this page, the bottom of the outlet tee (drawn in blue in the sketch) should be 2 or better 3 inches deeper into the tank than the inlet tee. That green dashed line - - - we added to the drawing is just to illustrate that the bottom end of the septic tank inlet tee is about 3-inches higher in the septic tank than the bottom end of the septic tank outlet tee in the right in the sketch. The red dashed line is explained just below at "backwards septic tanks". This is insurance against pushing solids out of the tank when a toilet is flushed and the waste levels in the tank rise up briefly. If we didn't have this insurance of the extra length on the outlet tee extension, the surge of waste into the tank might push some of the floating scum layer and sewage through the outlet where it would quickly clog the septic piping or drain field. As we mention under diagnosing drainfield odors, the outlet tee also has the job of reducing the movement of gases back out of the tank into the drainfield. If you agree with the inlet tee dimensions discussed above, that means your outlet tee is going to extend down from the bottom of the tank outlet 16" to 18". Septic Tanks Can Actually Be Installed Backwards! Wrong tank elevations lead to sewer line clogs. The dashed red line - - - in our septic tank illustration above illustrates the 3-inch drop in elevation between the height in the septic tank of the inlet pipe opening and the height in the vertical tank wall of the septic tank outlet pipe opening. The red dashed line also shows the top of the liquid level in a properly functioning septic tank. A built-in vertical drop of approximately three inches between the inlet and outlet pipe is common. We have received a few reader reports of exactly this backwards septic tank installation problem that shows up as recurrent sewage line clogs between the house and the septic tank. In some cases these clogs were eventually traced to the septic tank having been installed "backwards" with its inlet end opening lower than its outlet end opening. No the fix was not to dig out the whole septic tank and turn it around. Once the tank has been installed, excavation and removal and rotating of a backwards-installed septic tank is probably cost prohibitive. But depending on the tank construction materials, it may be possible to adjust the inlet and outlet openings, sealing and repairing the tank end(s) as needed. Watch out: if the septic tank was installed backwards, the elevation of the waste line entering or leaving the septic tank is also going to need to be changed - this is not a trivial job, especially depending on site terrain. It may be easier to effect the repair at one of the tank than the other - raising the inlet end, or adjusting the inlet and outlet baffles or tees. Now if you want to add protection for your drainfield, you might add a filter at the outlet tee. A number of companies sell these devices which will add life to your drainfield by reducing the level of suspended solids flowing out of the tank. If you buy a septic tank outlet filter you'll see that the filter product will typically be of about the dimensions of the outlet tee we cited above, or perhaps an inch or two deeper. See the links below for more information about septic filters and septic media filter systems. See FILTERS SEPTIC & GREYWATER for details. 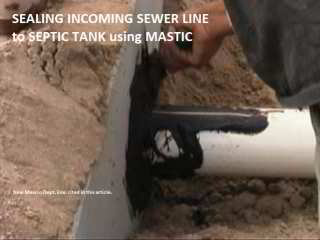 Illustration: connecting a PVC sewer line to the inlet end of a concrete septic tank using an asphalt based mastic adhesive/sealant. Adapted from the New Mexico Department of Environment system installation guide cited below. Note: the incoming waste line needs to slope towards the septic tank no less than 1/8" to 1/4" per foot - in the photo we can't see that this line is sloped towards the tank - but it might-be. Septic tanks, whether made of concrete, fiberglass, or plastic, are designed with a single inlet and outlet opening at the inlet and outlet ends of the tank. (Take care to get the tank properly positioned as the inlet and outlet openings are not at the same height). It is not only much easier to use the factory-provided septic tank openings to connect incoming waste and outgoing effluent lines than to try to cut and seal a do-it-yourself opening in the septic tank top, it is also more-likely to keep the septic tank working properly as I will explain here. 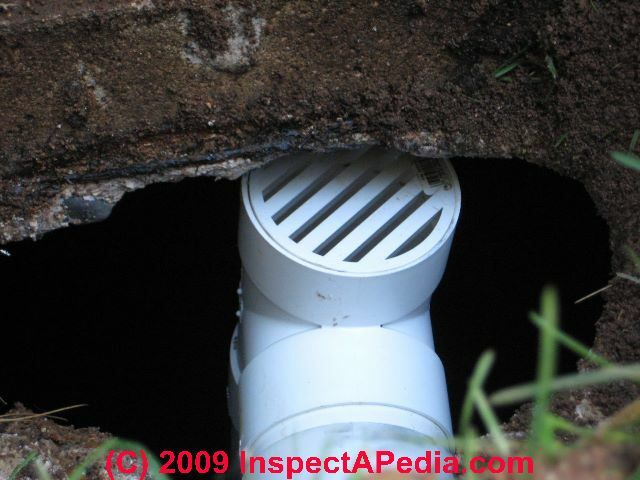 In reviewing our literature, standards, codes for septic tank installation I have not found any source that describes a through-top connection of the sewer line into the tank. Watch out: do not bypass septic tank baffles when connecting piping to the septic tank. Normal septic tank design that relies on baffles to control the flow of solids and wastewater into the tank, to control agitation inside the tank's treatment area, and to prevent the floating scum layer from blocking the tank inlet or outlet. The entering sewage must flow into the septic tank where there is a baffle system. For multi-compartment septic tanks, the incoming sewage also must flow into the proper (initial) compartment. Watch out: skipping the factory-designed pipe connections in order to cut a new opening into the top or sides of a septic tank risk damaging the tank, possibly causing the need for expensive repairs or even creating an unsafe septic tank at risk of sidewall collapse. 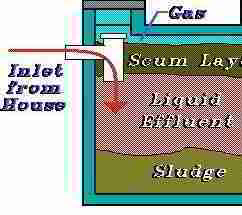 Watch out: undue agitation of sewage in a conventional septic tank resulting from a home-made top entry would direct waste towards the tank bottom where it can cause agitation of the tank's scum and sludge layers, leading to an expensive early failure of the drainfield system by pushing floating solids out into the absorption bed. If you are piping from any height, dropping waste vertically into the septic tank from some other tank top opening risks undue agitation of the sewage, preventing proper septic tank operation. We want the sludge to settle, the scum to rise and we do not want to push solids into the drainfield. Above: adapted from the New Mexico Environment Department Septic Tank Installation Guide cited below, we show a white PVC waste line being sealed to the septic tank entry port. The typical connections to the septic tank inlet and outlet ends using a neoprene collar to seal the waste lines to the tank. Where a neoprene collar is not used, the installer typically uses a fiber-reinforced asphalt mastic cement. Continue reading at SEPTIC TANK BAFFLES or see our complete INDEX to RELATED ARTICLES below. SEPTIC TANK TEES at InspectApedia.com - online encyclopedia of building & environmental inspection, testing, diagnosis, repair, & problem prevention advice. Advanced Onsite Wastewater Systems Technologies, Anish R. Jantrania, Mark A. Gross. Anish Jantrania, Ph.D., P.E., M.B.A., is a Consulting Engineer, in Mechanicsville VA, 804-550-0389 (2006), Advanced Onsite Wastewater Systems Technologies. Outstanding technical reference especially on alternative septic system design alternatives. Written for designers and engineers, this book is not at all easy going for homeowners but is a text we recommend for professionals--DF. Questions & answers about septic tank inlet tee and outlet tee requirements, function, and installation or repair Online Book, Inspection, Test, Diagnosis, Repair, & Maintenance: our Online Septic Book: Septic Testing, Loading & Dye Tests, Septic Tank Pumping, Clearances, details of onsite waste disposal system inspection, testing, repair procedures.